By Laura - Argentina - 04 Nov/02 - Viewed 1787 times. We are staying in a nice hotel called La Posta on Av Roca. The room is A$40.00 with a bathroom and breakfast. There is a sign in the room which says "Mister Passengers: We let you know you are hosted in La Posta. You will experiment and important cutback in our excursion and rent-a-car services". Yesterday we went on a tour to Peninsula Valdes, an area which attracts southern right whales, sea lions, elephant seals, dolphins and killer whales. The tour cost us A$54.00 each and we had to pay a further A$7.00 as a entrance fee. We were picked up at just after eight and quickly found that despite asking for an English speaking guide, our guide could not speak any English. After driving for about an hour we stopped at a small museum, which has some fantastic pictures of the whales and of killer whales about to attack sea lions. We then headed to Punta Piramide and arranged a boat trip to go out and see the whales. This cost A$40.00 each and is definitely worth paying for. I was worried that we might not see any whales but we found one very quickly. It was laid on its side spraying water into the air. It is surprising how close the whales get to the boats. They are very playful, jumping out of the water and flicking their tales up as they dive under the water. Unfortunately each time they jumped out of the water we would only manage to take a photo of the splash as they landed. Mark managed to get one of a whale mid jump but with a post in the way. The boat was also a over crowded so it was a bit of a fight to get a clear view of the whales. Nevertheless, it was amazing to see them in their natural habitat and we managed to see at least 5 different whales. Unfortunately the boat was very rocky so I was glad to arrive back on the beach. The tour involves quite a lot of driving to different points around the Peninsula. Our next stop was over an hour away to view the elephant seals. They seem to be rather lazy, sunbathing all day and trying to bury themselves, although I suppose they must have to go and eat sometimes. Another short drive down the road and we were able to see some penguins. There were not very many and most of them were shivering in small holes in the ground. Mark realised later that they were protecting their eggs. A further drive took us to a colony of sea lions. The guide showed us the channel where the killer whales come up to attack the sea lions. We were not able to see any though, apparently they are more common in January. There was an armadillo in the car park, a very strange looking creature. It was quite inquisitive and came very close, until a child on our tour decided to throw things at it. This was the final stop of the day and it took two hours to get back to Puerto Madryn, arriving back over an hour late. This is one point we learned about the tour operators in Puerto Madryn. They will lie about how much time you have at each place and what time you will get back. They seem to think you will not take the tour if you realise how much driving is involved. When we got back we arranged our bus tickets for tomorrow evening to Bariloche (A$58.00 each for a 17 hour journey) and went to the best buffet we have found so far for only A$12.00 each (the big Tenador Libre on Av Roca). 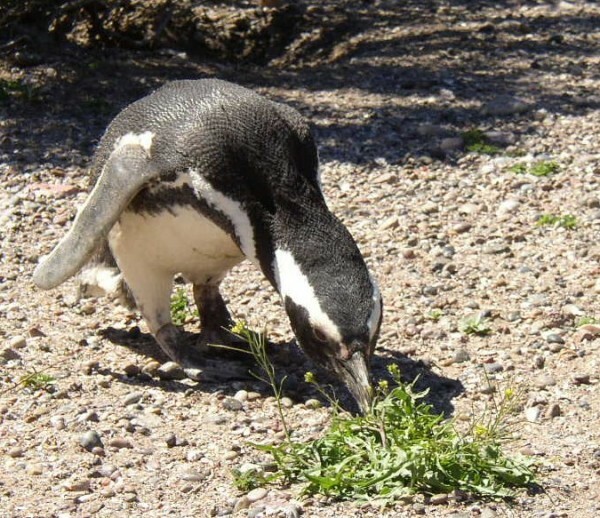 We went on another tour today to Punta Tombo for A$50.00 to see a colony of Magellenas penguins. It is quite far from Puerto Madryn and the drive there took about two and a half hours, allowing us to catch up on some sleep. There is supposed to be about a million penguins at Punta Tombo but they are spread out over a large area and were not in such large groups as I had expected. They were mostly huddled under trees protecting their eggs and would only come out when they needed a poo, which was a distinct lime green colour (I know you really wanted to know that). Occassionaly they would waddle past you when they made the long trip to or from the beach. We were told when we bought the tour that we would spend over two hours there but we actually only had an hour and a quarter before we had to leave to visit Gaiman. The tour stops at a tea house in Gaiman for a 'Welsh tea'. Apparently Princess Diana once visited there, which is probably why tea and cake costs more than I would pay for dinner. As neither of us like tea we went and looked at the main plaza in Gaiman instead. We were a bit worried that the tour might leave without us but eventually they picked us up. We thought that we would then be going straight back to Puerto Madryn when our guide informed us that we would be making a stop in Trelew, another Welsh town. We were a bit worried about getting back in time for our bus to Bariloche but did not really have much choice. Eventually we got back about over an hour late but managed to get to the bus in plenty of time.